DNA technology is evolving rapidly, with new methods and a fast-growing vocabulary. 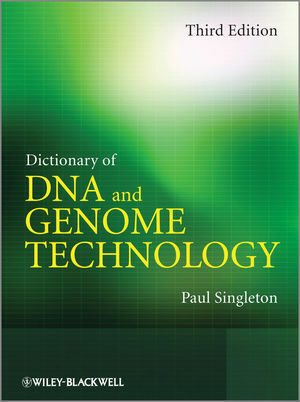 This unique dictionary offers current, detailed and accessible information on DNA technology to lecturers, researchers and students throughout the biomedical and related sciences. The third edition is a major update, with over 3000 references from mainstream journals and data from the very latest research – going well beyond the remit of most science dictionaries. It provides clear explanations of terms, techniques, and tests, including commercial systems, with detailed coverage of many important procedures and methods, and includes essay-style entries on many major topics to assist newcomers to the field. It covers topics relevant to medicine (diagnosis, genetic disorders, gene therapy); veterinary science; biotechnology; biochemistry; pharmaceutical science/drug development; molecular biology; microbiology; epidemiology; genomics; environmental science; plant science/agriculture; taxonomy; and forensic science. Paul Singleton is an independent writer and editor in biomedical science. His works include DNA Methods in Clinical Microbiology; Dictionary of Microbiology and Molecular Biology; Bacteria in Biology, Biotechnology and Medicine; and Antimicrobial Drug Action.